Supercomputing power and algorithms are helping astrophysicists untangle giant stars’ brightness, temperature and chemical variations. 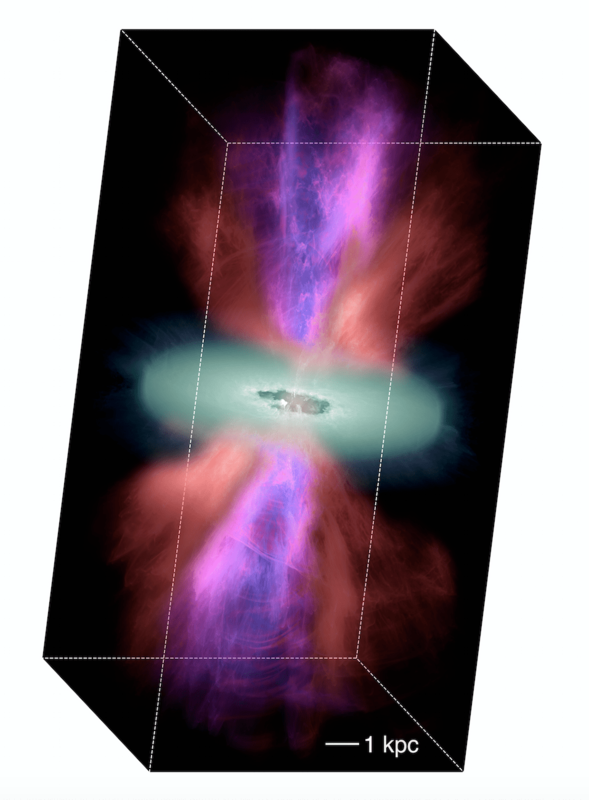 A frame from an animated global radiation hydrodynamic simulation of an 80-solar-mass star envelope, performed on the Mira supercomputer at the Argonne Leadership Computing Facility (ALCF). Seen here: turbulent structures resulting from convection around the iron opacity peak region. Density is highest near the star’s core (yellow). The other colors represent low-density winds launched near the surface. Simulation led by University of California at Santa Barbara. Visualization courtesy of Joseph A. Insley/ALCF. Since the Big Bang nearly 14 billion years ago, the universe has evolved and expanded, punctuated by supernova explosions and influenced by the massive stars that spawn them. These stars, many times the size and brightness of the sun, have relatively short lives and turbulent deaths that produce gamma ray bursts, neutron stars, black holes and nebulae, the colorful chemical incubators for new stars. Although massive stars are important to understanding astrophysics, the largest ones – at least 20 times the sun’s mass – are rare and highly variable. Their brightness changes by as much as 30 percent, notes Lars Bildsten of the Kavli Institute for Theoretical Physics (KITP) at University of California, Santa Barbara (UCSB). “It rattles around on a timescale of days to months, sometimes years.” Because of the complicated interactions between the escaping light and the gas within the star, scientists couldn’t explain or predict this stellar behavior. But with efficient algorithms and the power of the Mira IBM Blue Gene/Q supercomputer at the Argonne Leadership Computing Facility, a Department of Energy (DOE) Office of Science user facility, Bildsten and his colleagues have begun to model the variability in three dimensions across an entire massive star. With an allocation of 60 million processor hours from DOE’s INCITE (Innovative and Novel Computational Impact on Theory and Experiment) program, the team aims to make predictions about these stars that observers can test. They’ve published the initial results from these large-scale simulations – linking brightness changes in massive stars with temperature fluctuations on their surfaces – in the Sept. 27 issue of the journal Nature. Yan-Fei Jiang, a KITP postdoctoral scholar, leads these large-scale stellar simulations. They’re so demanding that astrophysicists often must limit the models – either by focusing on part of a star or by using simplifications and approximations that allow them to get a broad yet general picture of a whole star. The team started with one-dimensional computational models of massive stars using the open-source code MESA (Modules for Experiments in Stellar Astrophysics). Astrophysicists have used such methods to examine normal convection in stars for decades. But with massive stars, the team hit limits. The bodies are so bright and emit so much radiation that the 1-D models couldn’t capture the violent instability in some regions of the star, Bildsten says. To calculate the extreme turbulence in these stars, Jiang’s team needed a more complex three-dimensional model and high-performance computers. As a Princeton University Ph.D. student, Jiang had worked with James Stone on a program that could handle these turbulent systems. Stone’s group had developed the Athena++ code to study the dynamics of magnetized plasma, a charged, flowing soup that occurs in stars and many other astronomical objects. While at Princeton, Jiang had added radiation transport algorithms. That allowed the team to study accretion disks – accumulated dust and other matter – around the edges of black holes, a project that received a 2016 INCITE allocation of 47 million processor hours. Athena++ has been used for hundreds of other projects, Stone says. Stone is part of the current INCITE team, which also includes UCSB’s Omer Blaes, Matteo Cantiello of the Flatiron Institute in New York and Eliot Quataert, University of California, Berkeley. Another factor in teasing out massive stars’ behaviors could be the quantity of heavy elements in their atmospheres. Fusion of the lightest hydrogen and helium atoms in massive stars produces heavier atoms, including carbon, oxygen, silicon and iron. When supernovae explode, these bulkier chemical elements are incorporated into new stars. The new elements are more opaque than hydrogen and helium, so they capture and scatter radiation rather than letting photons pass through. For its code to model massive stars, the team needed to add opacity data for these other elements. “The more opaque it is, the more violent these instabilities are likely to be,” Bildsten says. The team is just starting to explore how this chemistry influences the stars’ behavior. The scientists also are examining how the brightness variations connect to mass loss. Wolf-Rayet stars are an extreme example of this process, having lost their outer envelopes containing hydrogen and instead containing helium and heavier elements only. These short-lived objects burn for a mere 5 million years, compared with 10 billion years for the sun. Over that time, they shed mass and material before collapsing into a neutron star or a black hole. Jiang and his group are working with UC Berkeley postdoctoral scholar Stephen Ro to diagnose that mass-loss mechanism. 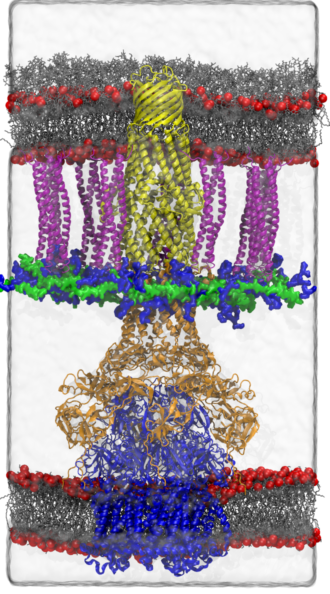 These 3-D simulations are just the beginning. The group’s current model doesn’t include rotation or magnetic fields, Jiang notes, factors that can be important for studying properties of massive stars such as gamma ray burst-related jets, the brightest explosions in the universe. The team also hopes to use its 3-D modeling lessons to improve the faster, cheaper 1-D algorithms – codes Bildsten says helped the team choose which systems to model in 3-D and could point to systems for future investigations.